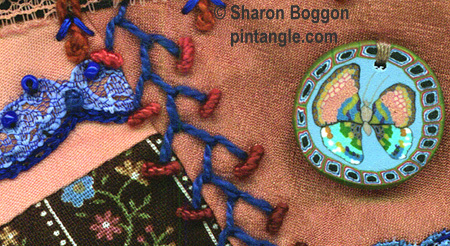 This series highlights hand embroidered seams and embellishments on my crazy quilt I dropped the button box. 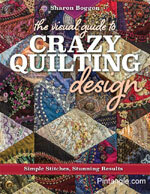 For a free pattern click on the block thumbnail. Today we have two details from block 77. 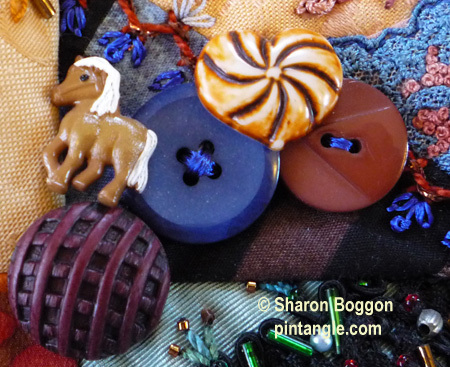 The first is cluster of modern buttons that sit in the corner of the block. The little horse is a reference to a favourite toy my daughter had when she was a child. 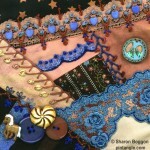 The maroon button sits at the very corner of the block and is helping to tie the quilt. The bottom image (detail 512) is of a very unusual hand made disk like decoration. I think it is made of fimo. I am not sure as I received it in a swap.